Minutes of the Annual Meeting of the CSM PC held at 7pm on Tuesday, 8th May 2012 in the Lower Committee Room of the Village Hall. Present: S Hutchings (In Chair), G Lucas, K Hunt, K Reed, Y Guest, G Hodge (from 12/81) (Parish Councillors). Mr Steve Altria (Clerk). Also in attendance were SCC Cllr David Fothergill (part to 12/87), TDBCllr D Durdan (part to 12/87) and members of the public.? 12/78. Public Speaking. No members of the public asked to address the Council. 12/79. Vice Chairman’s Welcome? Cllr Hutchings explained that as the Vice Chairman of the Parish Council that he would be Chairing the meeting as the Chairman had recently had a daughter. Councillors expressed their congratulations and good wishes to the Chairman and her new baby. 12/80. Election of Chairman. Cllr Hunt proposed Cllr Sampson and this was seconded by Cllr Lucas and unanimously agreed Resolved.? That Cllr Sampson be reappointed Chairman of the Parish Council. 12/81. Vacancies on the Parish Council. There are three vacancies. The Council can co-opt upto three individuals. A member of the public showed interest in being a Councillor and he explained why he was able to assist the Parish. Cllrs voted to co-opt and GH then completed his acceptance of Office. Resolved. That Graham Hodge be appointed as a Parish Councillor. 12/82. Vice Chairman. ?Cllr Lucas proposed Cllr Hutchings and this was seconded by Cllr Hunt and unanimously agreed Resolved.? That Cllr Hutchings be reappointed Vice Chairman of the Parish Council. 12/83. Apologies were received from Cllrs C Sampson, F Bates and P Chetwynd and their reasons for non-attendance were accepted. 12/84. Declarations of Interest. ?At the request of Cllr Hunt the Clerk reminded the Council that all local Cllrs should abide by the code of conduct, this requires them to declare any financial interests, gifts or hospitality that could influence any decisions they make. There were no declarations of interest made. 12/85. County and District Councillors Report. DF advised that the agent’s proposals and plans for improving safety on the A38 at Adsborough had now been submitted to SCC. It is probable that some of the suggestions made would be adopted but not all because of financial pressures. DF advised the Chair that he did not know SCC’s timescales for considering and carrying out the work. DF had noticed a missing road sign for Leighton Way Road on the David Wilson Estate and explained that he had reported to DW who had advised they would put in as sign in place within the month. DF informed the PC that there are 241 children in the school which is above the schools allocated places of 238. This will require the creation of an additional (ninth) class and the appointment of a teacher but at present there is no ninth classroom. DF explained that SCC had paid down ?15m of debt which equates to a saving on interest of ?1000 per day.SCC has also put aside ?10m to bring 50 megabyte broadband in by 2015. DD informed the PC that on Thursday 10th May was the TDBC annual mayor making. The new mayor would be Cllr Terry Hall and the Dep Mayor Cllr Libby Lisgo. ?The Olympic Torch will arrive in Taunton on the 21 May 2012 at Silk Mills Road/Heron Drive at 6:08 pm. This will mean a number of roads will be closed in the centre of Taunton from 10:00 am to 10:00 pm and diversions will be in place during 21st and 22nd May. A further rolling programme of road closures will also be operated by Avon and Somerset Police to allow the Torch to make its way through the town into Somerset County Cricket Ground at 6:50 pm. Full details are on the TDBC website. DD advised that the Warm Home Grants scheme is coming to an end. Since 2000 some 2.4m Households had benefitted. The last grants will be made in March 2013. Home?owners and private tenants or landlords can still apply on line at www.warmfront.co.uk or by telephone on 0800 316 2814. Free insulation is also available for these three groups through the warm streets scheme. For more information telephone 0800 082 2234. 12/86. ?Minutes of the last Meeting. The Minutes of the meetings held on 20th April and the 4th April 2012 copies of which had been circulated, were agreed. ?The minutes were then signed by the Chairman as correct. 12/87. Matters Arising from the previous meeting. The Clerk advised that he had raised with TDBC Planning Footpath T10/21 (between Langaller Road and Green Lane, Brittons Ash) as nothing had been seen to modify or extinguish the footpath despite the builders being there. A reply is awaited. Resolved. The Clerk to also make enquiries of SCC Rights of Way team and to ensure a reply is received from TDBC. 12/88. Working Group Memberships. As Councillors had considered their working arrangements as recently as April the opportunity was taken to consider any changes before determining the Groupings for the forth coming year. Resolved That the memberships of Groups be Planning Cllrs Hutchings, Bates and Chetwynd, Rec Field Cllrs Hutchings, Bates, Guest, Hodge and Reed, Highways and fly tipping Cllrs Lucas, Chetwynd, Hunt and Sampson. Footpaths. Cllrs Hutchings and Chetwynd, Complaints and Grievances Cllrs Reed and Chetwynd, Grievances and Complaints Appeals Cllrs Sampson and Hutchings, Disciplinary Cllrs Bates, Guest and Hunt, Disciplinary Appeals Cllrs Sampson, Hutchings and Lucas.? Cllrs Sampson and Hunt to oversee that nothing is forgotten from the previous minutes. That the PC represented by R Farrow at the Twinning Association and United Charities. Village Hall Cllr Reed. Wessex Water Sewage Project (Ham) Cllrs Lucas and Hodges. That membership of other Groups be agreed as required. 12/89. Accounts. The PC considered the Accounts for the 2011/2012 year. ?Resolved to adopt the accounts and authorise the Clerk to make the arrangements for the audit. The Clerk advised of the payments due. Discussion took place regarding whether to renew the SALC Membership and the difficulties being experienced by the former Chairman and the Clerk with regards to British Gas address billing and invoicing. The Clerk advised that TDBC were invoicing for emptying two (at Ham and North End) dog bins twice a week as authorised by the previous Clerk. ?Resolved. to make the following payments: SR Altria 24th May Clerks Salary ?370.12,? HMRC ?92.53 Tax due on Clerks Salary, SR Altria Clerks Receipted misc & travel Expenses ?75.16,? 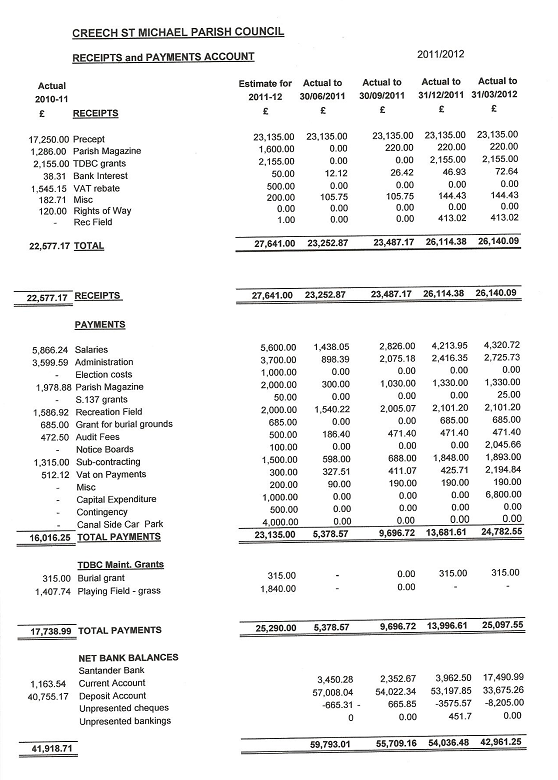 Ron Rooke ?40.19 Receipted misc & travel Expenses, SALC ?20 (Chairman's training), SLR Consultants ?1308.00 incl vat ?218 (advice and drawings), SALC ?20 Clerks training (audit), TDBC DLO Grounds ?1500.70 (incl ?250.12) 2011 cutting field and lining, Nigel's Window Cleaning ?45 (Bus Shelters Cleaning), TDBC ?604.03 re emptying the dog bins, SALC? 20/12/2013 Affiliation Fee Invoice ?575 , to monitor the benefits of SALC membership this year before so that a fully informed decision can be made for next year’s membership, that TDBC be authorised to continue emptying the two dogs bins throughout 2012 ?and for the Clerk to continue working to resolve with British Gas the pavilion utility supplies billing/metering. A discussion also took place regarding the management arrangements, need for lining and cutting of the grass and a desire to see greater use of the recreation field. Resolved to hold a Rec Field working group to address these points and to make a recommendation for a decision at a future PC meeting. The Clerk reported that two tenders had been received for the installation of the two new notice boards and the maintenance of four of the existing notice boards, a further two tenders for the maintenance of Merlyn’s Copse, Footpaths and the Rec Field Grass cutting. Resolved to accept the quote from Ian Pike to install the new notice boards and for the Clerk to meet him on site to facilitate the installation of and the undertaking of the maintenance work to the existing signboards. 12/90. Highways. Cllr Lucas reported that a hole has appeared in the road opposite the shop as a result of a manhole sinking and that he had reported it. A Sewer by the Bus Stop in Hyde Lane is also a concern. The path between Queens Down and Tristen Drive is uneven as a result of the tree roots raising the path. A sign has been put up again at Vicarage Lawns despite this having been previously been taken down. A manhole cover in the footpath at Worthy Lane (Opp Dwelly House) was also noted to be in a poor state. Concern was expressed over the visibility at the end of Charlton Road as the hedge needs cutting back. The finger post which should read “No through road” remains missing at the end of Charlton Road Resolved. The Clerk to report the dangerous sewer, path, hedge, manhole and missing sign. A38 Adsborough. See SCCllr’s report at minute 12/85. The PC noted that Roger Stoakley had submitted the following to David Fothergill. A report from the A38 Adsborough working party (that had been checked and approved by SLR consulting), a supporting letter from SLR, 2 x plans of alternative suggestions for the refuge / bus stops at the Maypole junction and a petition from the residents of Adsborough, Thurloxton, Shearston, West Newton and Creech St Michael containing 130 signatures. In addition the neighbouring parish council's - Thurloxton and North Petherton have these plans on their agendas. 12/91. Footpaths. The old concrete fence posts that were removed from the old footpath at the bottom end of Worthy Lane when the tarmac was laid have been abandoned in the grass on the other side. Resolved. The Clerk to report that the redundant concrete posts need removing. The tenders for footpath maintenance that been received. Resolved. That the tenders be considered at the working party meeting and a recommendation made for a decision at a future council meeting. Cllr Lucas advised that horses had been seen being ridden on the canal towpath (behind Rison Terrace) and in an adjacent field. Resolved. That the Clerk contact the field owner to see if he has given permission and report the horse riding on the towpath to the Waterways Board along with a request for larger signs. 12/92. Public Transport. The Clerk restated the points that L G Warburton had advised to the Council. Namely his view that the Taunton Bus Station has deficiencies, that buses were bunching of buses on route nos 15 and 21/21a, asking why the bus stops do not have Webber Bus T/T, that there are problems with bus shelters with seats facing away from the road and of the dangerous siting of the bus stops in Thurloxton. Cllrs considered these points. They agreed that the 9.07 am Bus on route 15a does not always turn up. Resolved. That the Clerk invite Webber Buses to a future PC meeting. 12/93. Recreation Field. Tenders for grass cutting and the frequency of lining and cutting of the field have been received. Resolved. That the tenders are considered at a working party meeting and a recommendation is then made to a future council meeting. The Vice Chairman reported that the S106 monies due from the Hyde Lane Developers to fund play equipment at the Rec Field was still outstanding and had yet to be received. Both the Vice chairman and Clerk have raised this with the TDBCs Legal Officer. Resolved that the Clerk ensure TDBC have invoiced and / or has been paid. (Note from Clerk: the S106 money has since been paid). The Clerk reported that he had spoken to the TDBC Dog Warden about dogs fouling on the Field. She had advised that the Recreation Ground is covered by the Dog Fouling of Land Act 1996 and prosecutions can be made. The former Children’s Play area and tennis courts are covered by a specific bylaw prohibiting dog fouling a fixed penalty notice can be issued. She advised that any new play area should be fenced to be enforceable and will require the bylaw to be amended (this would be done through TDBC legal). The current signing “strictly no dog by order of management” is correct but she suggested the PC consider putting up more similar signs. 12/94. Merlyn’s Copse. The tenders for site maintenance have been received. Resolved. That the tenders be considered at a working party meeting and a recommendation made for a decision at a future council meeting. It was noted in the recent heavy rains that the stream was full. Resolved to remove the tree debris that had collected during the summer. 12/95. Website. The PC considered a request from Eric Chown for thumbnails and text giving some detail about each Councillors interests and a very short personal profile and photo for posting on the Website. Resolved that each Cllr provide such text to the Clerk for collation and that Cllr Hunt bring his camera to the next meeting to take photographs. 12/96 Parish Magazine. The Deadline for copy for next magazine is 15th May, with delivery mid June. The Editor needs help invoicing and collecting the advertising revenue, she also needs help distribution and the recruitment of advertisers. Resolved that the Clerk write an article on behalf of the PC, that he help out with this invoicing and payment chasing/collection, that Cllrs Guest and Hodge help with delivering and that all Cllrs canvas businesses to advertise. Enquiring if CSM PC wishes to buy a defibrillator for use locally and offering a demonstration. CSM PC supported the SCC alternative e.g. in the same ward as Ruishton. Details of three training courses. Posters placed on larger notice boards. Email offering to volunteer distribute Parish Magazine. Quote for 2012 cutting rec field and lining/request to learn frequency of cutting required in future. Email giving details of two free Clerks training courses. Email advising Power of wellbeing revoked wef 4th April 2012. A new power is available but with criteria. Email re non-payment of S106 monies and advising now Invoicing West of England Dev. Email advising PC of a project meeting re Ham sewerage works project on 10th May at 6pm and inviting a representative to attend. Asking if CSM PC wishes to have dog bins emptied twice a week (Bins at Bull street and Ham) during 2012. 12/98. New Matters to carry forward to the next meeting. ? (1) The Canal Car park. Cllrs asked that the Council review whether to purchase the car-park and to consider the benefits and liabilities of it doing so. (2) Whilst the owner of the field at Langaller had been identified it was not certain whose the damaged fence is. SCC highways have also denied responsibility. (3) That DF suggestion that speed strips be put down outside the shop be pursued. 12/99 The Chairman closed the meeting at 9.45pm to the Public and Press in order to discuss staff matters. Minutes of the Meeting of the CSM PC held at 7pm on Thursday 24th May 2012 in the Lower Committee Room of the Village Hall. Present: C Sampson (Chair), S Hutchings, G Lucas, K Hunt, P Chetwynd, K Reed, Y Guest, G Hodge (Parish Councillors). Mr Steve Altria (Clerk). Also in attendance was a member of the public.? 12/100. Chairman Welcome. Cllr Sampson welcomed all to the meeting. Public Speaking. No members of the public asked to address the Council. 12/102. Declarations of Interest. ?There were no declarations of interest made. 12/103. Recreation Field. (1) Play Equipment. 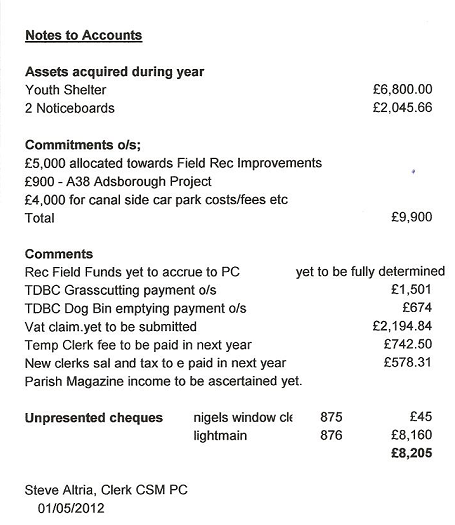 SH advised the PC that the ?187 200 S106 monies had now been paid to TDBC and that the Rec Field Working party had met following considerable consultation to consider in detail the Play Equipment to be installed. It was noted that the Football Pitch needed to be kept the same size for senior league matches but could be used crosswards to create junior pitches and that rugby poles be installed to further increase use. The pitch would be moved to the left on the same orientation to enable the equipment to be accommodated between the pitch and TME. It is hoped that some of the equipment will be in place before the summer holidays. A Multi Use Games Area (MUGA) would also be sited. This would have a special surface, be fenced and have pod seating. Cllrs expressed the view they wished to see this area principally used for fun rather than organised games and expressed their commitment to ensuring that happens. A discussion took place about the overall area. In particular the shipping container and the pavilion. It was noted that the PC had a provision of upto ?5000 to be spent on play equipment. Resolved. That the Council purchase a MUGA and various play equipment to be sited on the Rec Field, Hyde Lane. That the final equipment choice be confirmed by the working party following further consultation with TDBC. The costs to be within the budget available of ?192 200.00 Ideas would also be put forward to the PC upto the value of ?1000 which was allocated to the jubilee and it was agreed would be used to improve the field and pavilion area. The Clerk to cost. (2) TME. As part of the periodic inspection of the recreation field deficiencies in the fencing surrounding the TME area have been identified. In particular that there was barbed wire, some bolts needed attention and some areas needed making good. This was of concern to Cllrs. Resolved that the Clerk advise TME of the need to make improvements to the fencing of their area by the end of June 2012. (3) Grass Cutting. SH advised that quotes for the grass cutting and lining of the Recreation field as well as determing the frequencies of cutting and lining for 2012 had also been reviewed by the working party. It was recommended that lining be put on hold until required in sept and that TDBC be asked to cut the grass on a fortnightly basis. (4) Donation. It is believed that the late Gwyneth Bryant had left a sum of money to benefit the Rec Field. Unfortunately the cheque had been misplaced prior to being given to the PC. Resolved that CS undertook to make enquiries to see who her solicitor was in order to secure a replacement cheque. (5) Trees. It was noted that some trees would need lopping. 12/104. Footpaths. (1) Maintenance. PC advised that he had walked the footpaths that had been identified as requiring maintenance and had found many of them were being maintained.? The working party had examined the quotes obtained for maintenance and recommended that Ian Pike be awarded an amended contract. Resolved that Ian Pike be appointed to maintain footpath T10/15 (but not the side of the golf course) and T10/20 and that a quote be obtained to clear part of T10/21. (2) Horse riding. Further to the last meeting more horse riding had been seen taking place on the canal towpath at Charlton Bridge. Resolved that the Clerk make enquiries of the adjacent field owner and that the Clerk report the riding to the appropriate body, thought to be SCC. 12/105. Merlyn’s Copse. The working party had examined the quotes obtained for maintenance, cutting and strimming and felt that the area needed skilled management. It was recommended that the ownership and public access be re retained and that suitable tenant with the appropriate skills be given a lease. Resolved that KR make enquiries with the aim of the area being leased to and managed by a suitable countryside body and ?that Ian Pike be awarded an amended contract to cut, strim and clear away cuttings when he is specifically instructed to do so by the Clerk. 12/106 Accounts. The Clerk advised that he had made further requests of British Gas for copies of the outstanding electricity and gas bills for the Rec Field Pavilion. Despite this and having been promised copies in time for the meeting they had not been sent. Resolved that the Clerk continue to seek to acquire bills and for SH to read the meters.